On Friday evening, November 17, 1911, three Howard University undergraduate liberal arts students – twenty-three-year-old Oscar James Cooper (the laboratory assistant in Biology who was the link between Omega’s Founders and Professor Just), twenty-one-year-old Frank Coleman and twenty-year-old Edgar Amos Love - met with their faculty adviser, twenty-eight-year-old Professor Ernest Everett Just, in his office in Science Hall to establish a fraternity. At this meeting, they decided upon the motto “Friendship is essential to the soul” as symbolized by three Greek letters ΩΨΦ - Omega Psi Phi - which are the initials of the three Greek words - Ophelema Philia Psurkis - that represent the motto: Friendship is Essential to the Soul. They chose Manhood, Scholarship, Perseverance and Uplift as the four Cardinal Principles of the Fraternity and decided upon the design of the Fraternity’s pin and escutcheon. On Thursday, November 23, 1911, the three undergraduate Founders met and elected Edgar A. Love as Grand Basileus, Oscar J. Cooper as Grand Keeper of Records and Frank Coleman as Grand Keeper of Seals. After carefully studying the student body for prospective candidates, they chose eleven men who not only possessed the principles upon which the fraternity was founded, but also were willing to help Omega on its way. The eleven Charter members were chosen for the first chapter of the fraternity, Alpha, established at Howard University. The three Founders then formed a committee to draw up a constitution to be submitted to the President of the university for faculty approval. On Thursday, December 8, 1911, the committee made its report to the Grand Chapter, the constitution was adopted and each charter member signed the original document that was submitted to Howard’s President Wilbur P. Thirkield. The Grand Chapter had to work hard to win faculty approval at Howard although the men who signed the constitution were student leaders in academics and extracurricular activities. Not waiting for faculty approval, they placed placards in conspicuous places around campus announcing the existence Omega Psi Phi Fraternity, and listing the members. Written history reports that on December 15, 1911, prior to faculty approval, Alpha Chapter, The Mother Pearl, was established at Howard University with fourteen Charter members. Along with the Founders, eleven stalwart men who stood high in the scholastic record of the university and were members of its debating teams and heads of several auxiliary organizations, were selected 3 weeks earlier on November 23, 1911 formed the foundation of The Mother Pearl with Founders Frank Coleman as Alpha Chapter’s first Basileus, Edgar A. Love as first Keeper of Records and Oscar J. Cooper as first Keeper of Seals. Of the men selected by the Founders for the Charter members of Alpha Chapter, two of them, William A. Love and Julius H. Love, were the biological older brothers of Founder Edgar A. Love. William was three years older at 22 and Julius was six years older at 25. Note: Founder Love’s three years younger brother John W. Love would be initiated in Alpha Chapter on February 13, 1914. 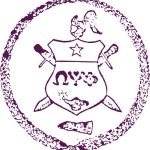 While still awaiting faculty approval of its constitution, and confident that approval would eventually come, Alpha Chapter voted on new members on February 21, 1912. On February 28, 1912, members of the temporary chapter took the oath of allegiance and Alpha Chapter held its first initiation, adding four new members. The permanent chapter was established with the election of a Basileus, Keeper of Records and as Keeper of Seals. On March 2, 1912, a report to the Grand Officers and Alpha Chapter on a conference with the faculty noted that the President of the university resisted the fraternity’s national aspirations – remember, Howard University was a school for blacks, but with a white administration – and in a vote on March 8, 1912 university officials voted not to recognize the fraternity as a national organization. But Omega’s leadership refused to accept limited recognition and kept the article in the constitution regarding Omega Psi Phi Fraternity’s national aspirations. Eventually, the faculty withdrew its objections and recognized the Fraternity as a national organization. The Omega Psi Phi Fraternity, Grand Chapter was incorporated under the laws of the District of Columbia on October 28, 1914 with Founders Edgar A. Love as Grand Basileus, Oscar J. Cooper as Grand Keeper of Records and Frank Coleman as Grand Keeper of Seals. 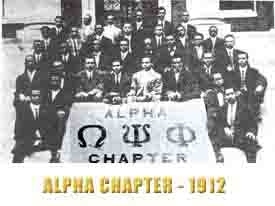 There is some "debate" on the original number of men selected by the Founders to be Charter members of Alpha Chapter. Omega’s written history indicates the three (3) undergraduate Founders plus eleven (11) others being selected for a total of fourteen (14) Charter members. This is the only written reference to 17 charter members of Alpha Chapter to date, but the source of the information must at least cause one to pause when compared to official records - that are admitted to being incomplete. Additionally, when reviewing the lineage of Alpha Chapter from the Charter Line initiated December 15, 1911, up to and including the line initiated in the Fall of 1929, there are references with almost every initiation of members, that lists names of individuals who’s, “year of initiation has not been determined as of yet,” but who had been initiated, “within or before” the initiation year being highlighted. There is no note for 1911 or 1912, but for 1913 the annotation is for one person and for 1914 there are two people. These 3 easily could have been on the 1911 charter line. This scenario is minutely possible - but highly likely.